Nigerian security forces have stormed a mosque where militants from an Islamic sect blamed for days of deadly violence have been hiding out. 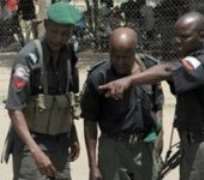 Reports say scores of fighters were killed in the assault, which came after a third night of gun battles in the northern city of Maiduguri. Many of the militants have now fled, attacking police stations on their way. The group, known as the Boko Haram, wants to overthrow the government and impose a strict version of Islamic law. The assault by the security forces came after 1,000 extra soldiers were drafted into the city. Army commander Major General Saleh Maina told the Associated Press that the deputy leader of the sect was killed in the bombardment, which continued through Wednesday night. But he said Mohammed Yusuf, leader of the group also known as "Taliban", escaped along with about 300 followers. An AP reporter who watched the storming of the mosque counted about 50 bodies inside the building and another 50 in the courtyard. The latest deaths would mean about 300 people have been killed in four days of clashes since an estimated 1,000 militants began attacking police stations and government buildings in Maiduguri. President Umaru Yar'Adua has ordered Nigeria's national security agencies to take all necessary action to contain and repel attacks by the extremists. Security forces flooded into Maiduguri and began shelling Mr Yusuf's compound on Tuesday, sparking gun battles. The militant group has stirred unrest in four states - Borno, particularly in the state capital Maiduguri, Bauchi, Kano and Yobe.